valencia-born artists pichi and avo, otherwise known as pichiavo, installed an 85-foot-tall neoclassical sculptureonly to have it set ablaze. 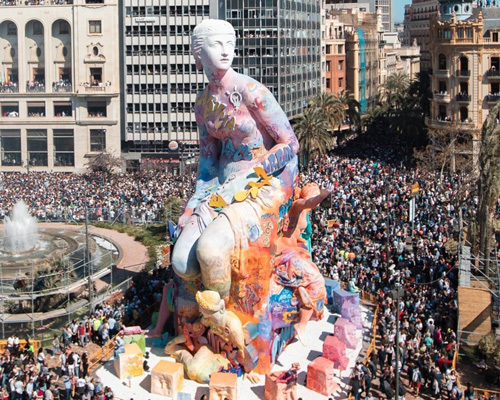 the neoclassical sculpture was made to commemorate saint joseph on the annual las fallas festival in valencia where it was burn during the peak of the event along with 400 bonfires throughout the city. t took 12 months for pichiavo to finish the incredibly large-scale piece, partnering with local fallas artisan firm latorre y sanz to execute the final sculpture. fallas, which means torch in valencian is the term given to the giant figurines that take over the city during the course of the festival. dating back thousands of year, the ceremony marks the start of spring and signifies new beginnings. what started out as a merely carpenters burning old materials has turned into a flaming five-day street party, with artists now offering work for eventual incineration as part of its tradition. evreka is on view at the centro del carmen in valencia until may 5, 2019. in addition, a show dedicated to pichiavo’s limited editions will be on view at plastic murs gallery between march 7 and april 19, 2019. you can see more of the artists’ previous works on their website and instagram.